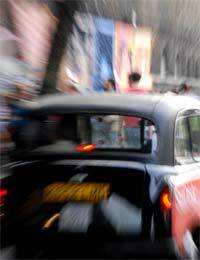 "A frightening experience five years ago completely changed my attitude towards taxis and how careful I am when getting in one alone. I had always thought of myself as fairly sensible but now I see that I took unnecessary risks, probably in the same way that many other young women do, which put me in a vulnerable position. "I was meeting some friends who live on the other side of the city for drinks and dinner in town. I pre-booked a taxi from my home and got to the bar we were meeting in with no problems. We had a great night, and yes, I had a few drinks. I was tipsy but not roaring drunk. My friends decided they wanted to go on elsewhere but I had a bust day lined up the next day so decided to head home. As I was on my own, my friends insisted on waiting with me in the taxi queue but I pointed out that, although long, it was staffed by taxi marshalls and I would be fine. It was silly for them to stand in the cold as well when they could be in a warm club. "They agreed and left. But the taxi queue was interminable and just did not seem to get any smaller. So, knowing that there would be plenty of cabs around the corner, I left the relative safety of the queue and went to find my own cab – a huge mistake on my part. I don't know why I thought it would be ok, perhaps because I had done it before, but it was a silly thing to do. "Once around the corner, away from the crowds, it was dark and I was scared. So I jumped into the first car which pulled up and seemed to be a taxi. I gave the driver my address and off we went. But halfway there, he pulled into a layby and locked all of the doors. He turned to me in the backseat and started to climb over. I was terrified. I had nowhere to go, and even if I had got out of the car, I didn't know where I could go. I was on a deserted road with no-one close by. "Somehow though, as his leering face approached me, my survival instincts kicked in. I clawed at his face and hands and spat in his face. Somehow, I still don't know how, I managed to climb out of the car, unlocking the door as I went. I stumbled into the road, terrified that he would come after me. But he was scared of being caught and drove off. I called the police from my mobile, and when they arrived, I started to realise quite how stupid I had been and how close I had come to being seriously harmed. "The taxi driver has never been caught, partially because I was unable to provide a description of either the driver or the car. I had been so intent on getting out of the cold and off the dark streets that I hadn't given it a second thought. Hopefully he didn't manage to do the same, or worse to anyone else and has been picked up for driving an unlicensed cab. On the other hand, he could still be out there. "I tell my story to as many people, especially women, as possible. It is a warning to us all – it doesn't matter how cold or wet it is, cities provide taxi ranks, licensed cabs and even taxi marshalls for a reason. Now I try not to take cabs on my own at all but if it's unavoidable, I always flag down a black cab, and always use a cab rank. I take a good look at the driver and try to memorise his number and the car registration. It is the only way of making sure you are keeping yourself as safe as possible."